In my world, Valentine’s Day isn’t just about one special person in your life, but for sharing the love far and wide. The real beauty of this philosophy is that it is incredibly easy to achieve, and makes everyone feel good. Make heart shaped toast. You just need to use a cookie cutter, but it really does taste better this way. 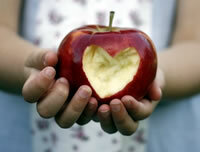 Encourage some healthy eating, by serving up some strawberries, melon, apple, cucumber, etc, cut into heart shapes. Make some Valentine’s paper wreaths and decorate your club. Make paper plate heart hats - perfect for getting everyone in a happy mood. Bake and decorate heart-shaped biscuits. Any biscuit recipe will do but make sure you have lots of sprinkles and sparkles for the decoration. 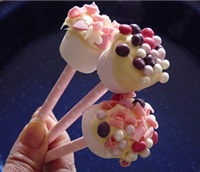 What about making marshmallow pops? So pretty, and good to share with friends. Make popcorn confetti - a lovely gift for those special people in your life.